Hello, readers! After my mismatching Monday outfit a couple of weeks ago, I decided it was time to again embrace my love of power clashing (clashion, if you will). This time, I went with red, green, blue, and yellow bold tones. When I found a great nail polish on sale for 70 cents (what?!) at Walgreens this weekend, I was inspired to go classic red with my nails to match my red shoes. The nail polish is Wet n’ Wild “Red red” and is normally $1. Interestingly enough, this is one of Cosmo’s top award winners for red nail polish. Who knew? While I was having a nail polish party, I did my toes too! 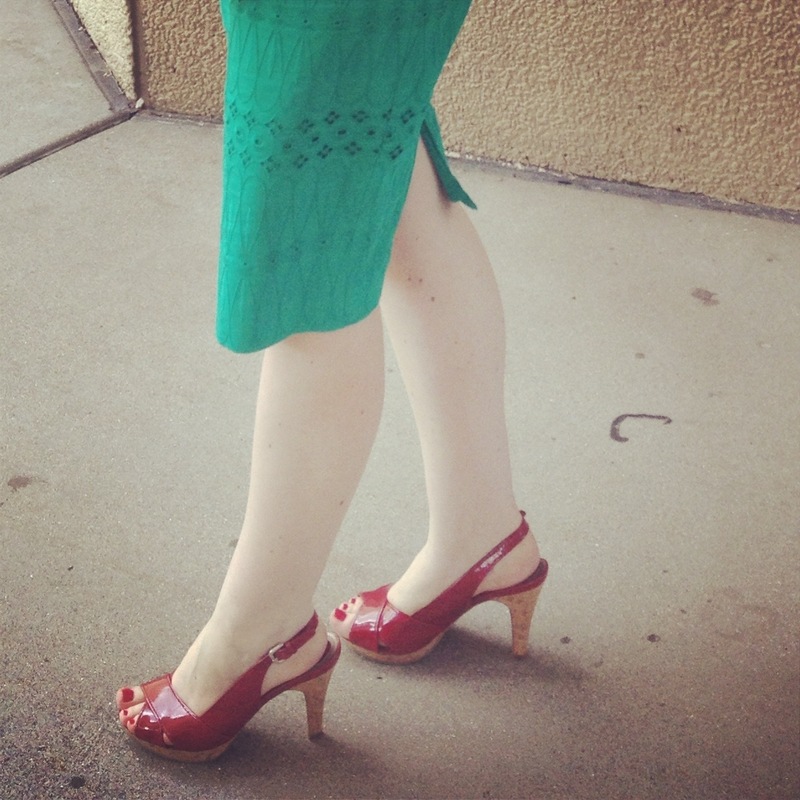 I love how the green skirt looks with the red heels and nails. 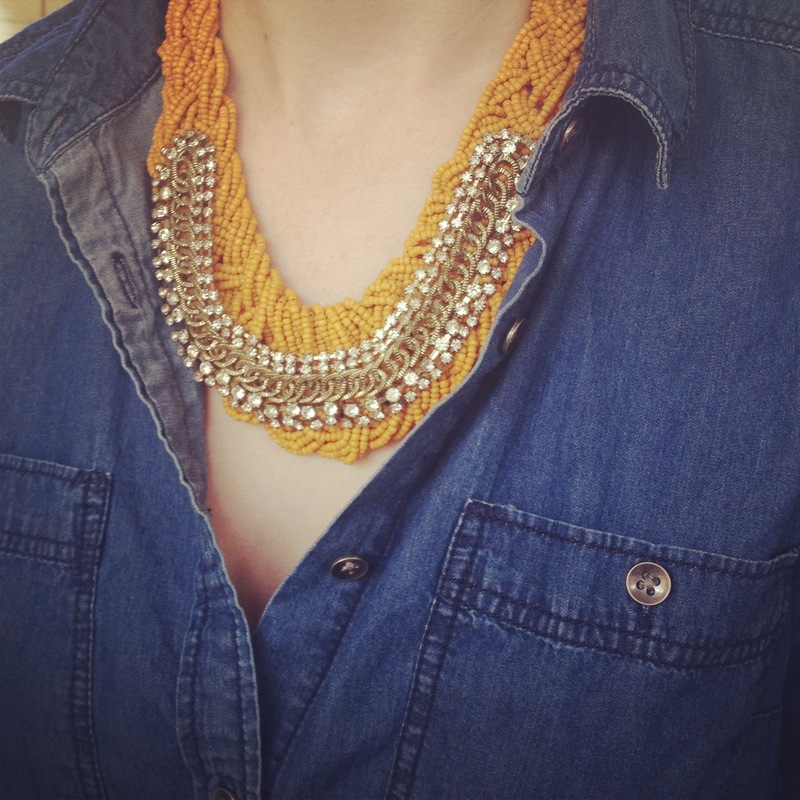 I added my Charming Charlie clearance find yellow necklace to keep with the primary color theme. And ta da! Power clashing in the best way (at least, I think so!)! 1) Sometimes, I think, it is good to get back to the basics. This outfit was all about primary colors and basic color pairing. If you want to wear all different colors and not look like it was an accident, consider wearing colors that are similar tones. All of these colors are different, but the tones are the same and, as a result, the outfit looks coherent. 2) I do not know what it is about denim that I love so much! If you follow my blog, you have seen my many postings in ode to denim. Perhaps my love comes from the fact that denim is very versatile and easy to match. I got this particular denim top at Forever 21. Even though it was only $20 (not even on sale! ), it is practically indestructible. I also bought it one size up from my regular size so I could pair it with more fitted pants and skirts without looking as though I am wearing too much tight clothing for work. While the skirt is fitted, the top is a bit looser, which makes this look perfect for work! Thank you for reading, all! I hope the end of the week goes well! Onward with your fashion huntress endeavors! I love every outfit you post, I have a skirt in this teal color and chambray you have just inspired a new look for me, thanks! Oh goodness! I’m in love with your skirt – the color, the texture, everything! Thank you! It’s a different texture/fabric than any of my other skirts and I really like it- it’s good to branch out, right? Thank you for visiting!! Definitely. I think everyone needs to try something new every once in a while! Love this outfit!! Whoever said: Blue and green should never been seen, unless there is something in between, had no style. Obviously. Personally I love the combo. I am so sourcing a chambray shirt after seeing this. Ha! I’ve not heard that before! But, I completely agree with you; you always have to do what you feel comfortable with and aesthetically, I agree, this works! It’s fun to break “rules” 🙂 thanks for visiting and commenting! Thank you! It is very chic looking, but is completely soft and comfortable…which is definitely my ideal combination! Thank you for visiting and for your support!